H.E. 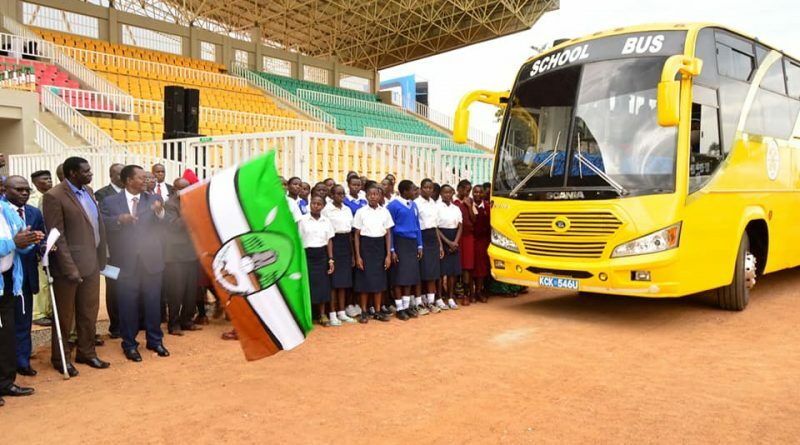 Prof. Philip Museve Kutima today flagged off eight teams comprising of 136 participants to represent Kakamega county and the country in the upcoming East Africa School Games to be held from 10th-19th August in Muzanze, Rwanda. The teams are Kakamega High School rugby 15s’ and soccer teams, St. Peter’s Boys Mumias rugby sevens, Archbishop Njenga soccer girls, Malava Boys volleyball, Musingu High school hockey, Butere girls high school basketball and a composite team for athletes and indoor games. Kakamega county has the highest number of teams participating. H.E. the deputy governor congratulated the group for an exemplary performance during the just concluded national competitions held at Hill school, Eldoret. He called on the young athletes to proudly and courageously carry the county and country flags high in Rwanda. Prof. Kutima said the county government of Kakamega understands the importance of sports with regards to fostering unity and cohesion in the society and nurturing talents. “As you go out there to represent our country, remember sports is no longer just a leisure activity but a high income generating business,” he said. The deputy governor assured them of Kakamega County Government’s full support to ensure their talents are nurtured through among other approaches equiping of the various sports facilities in the county, strengthening the county sports committee and revamping the sports youths training centres in all the 60 wards. Social Services, Youths, Culture and Sports CECM Hon. Robert Makhanu announced that the county government through his ministry was engaging Masinde Muliro University of Science and Technolgy (MMUST) for a possibility of the institution to offer scholarships to bright and needy students who excel in both sports and academics. Present also were CEC Members for Roads, Public Works and Energy Dr. Collins Matemba and his Education, Science and Technology counterpart Joseph Indire, Chief Officer Phitalis Masakhwe, MCAs, County Director of Sports Moses Muchiri, Stadium Manager Titus Otiende, County Youths & Sports development officer Edward Odera, Chairman Western Region Secondary schools Sports Association Francis Juma and the association’s Secretary Quinto Omusugu as well as the association’s Kakamega County Chairman Martin Waswa among others.